Due Out March 20, Fred Rogers’ Birthday! 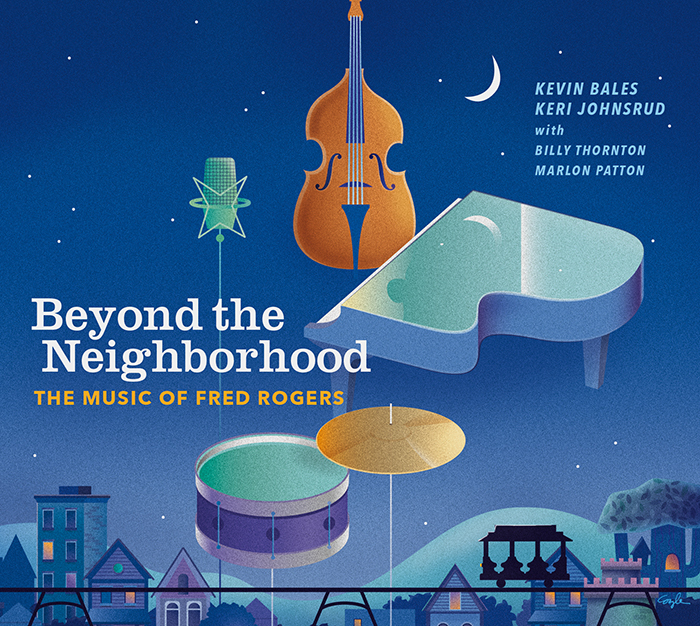 Chicago-based vocalist Keri Johnsrud and GRAMMY nominated pianist Kevin Bales have come together once again for the March 20th release of Beyond the Neighborhood: The Music of Fred Rogers. With the help of an esteemed rhythm section featuring Billy Thornton on bass and Marlon Patton on drums, Johnsrud and Bales have succeeded in reimagining and rearranging the music that has been heard by numerous generations on the beloved children’s television program Mister Rogers Neighborhood. The songs, which up until now were specifically tailored for a child’s ear, are now presented as reinvented gems that are wise and wistful, simple but not simplistic, and even, in some cases, a bit sultry. In this collection, Mister Rogers’ songs not only relate to adults; they seem to have been written for adults in the first place. Fred McFeely Rogers – the cardigan-wearing, sneaker-shod, quintessentially gentle Presbyterian minister known as Mister Rogers on the awards-winning children’s TV show that aired for nearly 35 years – also wrote the songs he sang on his program. He wrote a lot of songs, and he wrote them well. As a kid, you might not have noticed the craftsmanship of these songs, but as an adult, you can’t miss it. These songs left their mark on three generations of children who made Mister Rogers’ Neighborhood part of their after-school routine. This project began over two years ago when Johnsrud and Bales discovered that they had a deep mutual love and admiration for Fred Rogers, while having a conversation about children’s programs they used to watch growing up. It was obvious to them that music played an integral part in the programming of Mister Rogers’ Neighborhood and were amazed at how that music remains relevant today. Most songs written for youngsters try to impart messages about love and family, friendship and sharing, belief in one’s self-confidence but respect for others – messages that too many adults seem to have forgotten. “We wanted to take these songs, which we grew up with as kids, and make them relatable – more accessible – to adults as well. We discovered that a lot of Fred Rogers’ music cannot translate across the generations; those songs very much catered to children. We took the songs that could be heard as adults, the songs that he implanted in our brains when we were children and that are still poignant to us now,”Johnsrud explains. What a lot of people don’t know is that Fred Rogers composed all of the music heard on his programs (The Children’s Corner, The MisteRogers Show, Mister Rogers’ Neighborhood). In fact, Kevin’s first introduction to jazz was listening to the music performed live by pianist and musical director Johnny Costa and his trio on Mister Rogers’ Neighborhood. With that said, Keri and Kevin wanted to compile a list of songs that may be familiar to some and unfamiliar to others to showcase the depth of Fred’s songwriting talent. The pair also wanted to arrange these tunes in a way that could appeal to all generations, so that families could listen to this music together. The beauty of these compositions lies in the simple messages found in each of his songs (those of self-worth, acceptance, and kindness) and can apply to all, whether young or old. By some measures, Kevin Bales was a latecomer to jazz, already 17 when he encountered the sounds and structures and became captivated by the freedom and corresponding challenges of the music. But if late to the party, he wasted no time in immersing himself in the celebration, declaring total commitment to what would be his life’s work and backing his announcement by resigning his job and designated career in computer programming. Kevin could commit to jazz with a reasonable degree of expectation. He was already an accomplished pianist, with classical chops refined since the age of 10. So accomplished he was invited to audition for the Atlanta Symphony Orchestra, at age 16. Kevin’s initial career move was to the University of North Florida and a budding if little-known jazz program. There he met and performed with, and went on to record and tour with, a number of monumental artists, including Wynton Marsalis, Louie Bellson, Eddie Daniels, James Moody, Ben Tucker, Ira Sullivan, Sam Rivers, and Nat Adderley. He counts among his mentors bassist Ben Tucker, multi-instrumentalist Ira Sullivan, guitar legends Nathen Page and Jack Petersen, and the fiercely individual saxophonist Bunky Green. His meeting with Bunky Green led to five years of tours. His encounter with guitarist Nathen Page blossomed into 15 years of spot tours and four albums. And his work with trumpeter extraordinaire Marcus Printup has become a lifetime association that has included recordings on Blue Note/Capital records. Ten years touring and recording with vocal iconoclast Rene Marie culminated in a Grammy Nominated album. Few artists have the patience for teaching – as are few teachers accomplished players. But Kevin has amassed a reputation for his prowess in both professions. While still a senior at North Florida he was drafted into a full teaching load, and continued to be an integral part of the school’s jazz program for upwards of a decade. Today, Kevin manages his own jazz program, overseeing an ambitious schedule of jazz students. Kevin has accumulated a long list of awards and a reputation as one of the finest jazz pianists performing anywhere. In 1994, less than a decade into jazz, he won the American Pianist Association’s Jazz Piano Competition. In addition to nearly every important jazz venue in the South, he has performed in some of the most acclaimed clubs and festivals in America and around the world: the JVC Jazz Festival in New York, The Bakery in Los Angeles, The Kennedy Center and Lincoln Center jazz series, the Toronto and Edinburgh jazz festivals, and the Moscow Center for the Performing Arts.